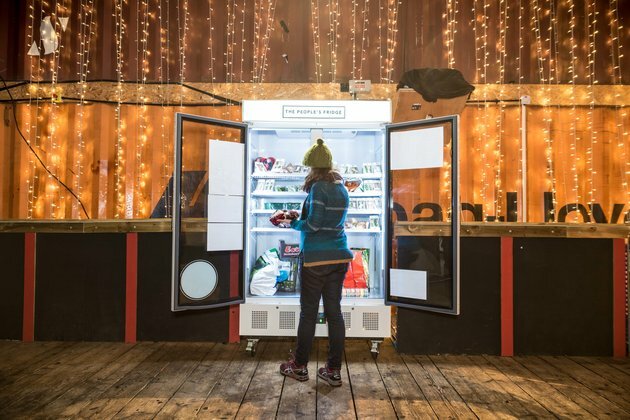 The “community fridge” is a concept already proven to be popular in Spain, Germany, and India, where businesses and residents can leave excess unwanted food to be taken, free-of-charge, by those who really need it. Now, thanks to a dedicated team from Brixton and a successful crowdfunding campaign, ‘The People’s Fridge’ has arrived in London! The People’s Fridge initiative, which aims to cut food waste and reduce food poverty, is the brainchild of a team of Brixton residents, food activists and markets traders headed up by Olivia Haughton, Rebecca Trevalyan and Ben Longman. According to the crowdfunder page, The People's Fridge started when a programme at Impact Hub Brixton, called 'U.Lab: Grow Your Own Leaders', brought a group of 25 people together to think about how we grow, eat and distribute food. Hearing tell of a similar project in India, the initiative was born and quickly entered the planning stage. The new fridge, which local traders have volunteered to help with the stocking, cleaning and maintenance of, has now been installed in Pop Brixton. If proven successful, the team hope to install more fridges in other locations around the UK, fighting against food waste on a national scale.